Except when placed at curbside for pickup in compliance with this section, garbage cans or receptacles shall AT ALL TIMES be stored BEHIND A FENCE, enclosure or shall otherwise be SCREENED from view. This means that you MAY NOT store your trash cans and/or recycle bins in front of your garage door, or at the side of the house if they can be seen anywhere from the street or sidewalks (public view). 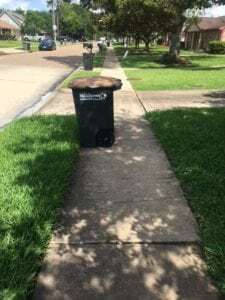 It shall be UNLAWFUL and in VIOLATION of this code and punishable to the maximum extent permitted by law for any resident, citizen or in habitant of the city to keep or store trash cans and/or recycle bins out in public view for more than 18 HOURS BEFORE a scheduled trash pickup. For any questions, please contact Code Enforcement at (281) 983-2938.